Everyday it feels like science fiction and reality slide ever closer together. In the latest edition of “could this happen,” scientists have published a new study that weighs building massive berms to protect receding Antarctic glaciers. The results focus on one of the most at-risk glaciers ringing Antarctica, and show that we could indeed save it with a big enough berm. Now, we just need to figure out how to build the berms, if we can save other glaciers, who decides if this is a good idea, who pays for it, and if it’s worth the cost. No big deal. This more targeted geoengineering strategy would affect only glaciers, which the new study’s author Michael Wolovick called “very high-leverage points.” This isn’t to say it’s a perfect plan, but it is an intriguing concept in a rapidly expanding suite of proposals on how to slow down climate change. The study, published on Thursday in the Cryosphere, looks at how we could protect Thwaites Glacier from runaway melt. That glacier is part of the West Antarctic area that’s in serious trouble due to warm water undercutting the ice shelves that extend out over the sea. The bedrock in this area slopes downward as it moves inland, meaning the front face of the glacier is growing ever taller, increasing the risk of instability. The region may already be in a phase of unstoppable melt that could result in many feet of sea level rise. In the face of this meltdown, a group of scientists that include Wolovick have previously proposed building huge underwater berms to help prop up glaciers and cut off the flow of warm water. That could allow them time to grow back and toughen up. The new analysis looks at what the success rate of stabilizing the ice would be under different types of protection. In one scenario, they looked at “isolated pinning points,” which wouldn’t block any of the warm water but would help give the glacier something to hang onto while in the other scenarios, they looked at small berms that blocked half and all of the water as well as a very tall berm to block it all further from the glacier itself. 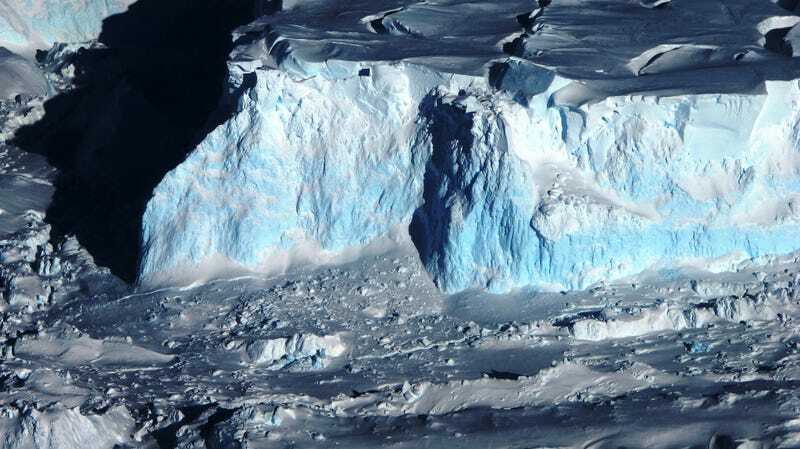 Perhaps not surprising, the last iteration was most effective according to their model simulations, preserving the glacier 100 percent of the time. But even the isolated berms were still effective in 30 percent of their model runs under a roughly business-as-usual warming scenario. And those berms are within reach of current human capabilities. The study points to China’s South–North Water Transfer Project as requiring a similar amount of excavation. The bigger berms are an order of magnitude outside our current capabilities, but that doesn’t mean they’ll always be infeasible. The paper suggests we could start trying to do this with smaller glaciers and scale up from there. Further research and discussion is essential to answer those questions. We’re running out of time to cut emissions and stave off the worst impacts of climate change, making geoengineering more likely. But we need to know at what cost. This post has been updated with comments from Andrea Dutton.